National Film and Sound Archive At a Glance separate storage locations, plus a browsing of Australia and its citizens, Waterhouse copy that remains on the network. This beltsays. "The work we do extends beyond and-suspenders approach aims to prevent just managing mobile devices and BYOD all possible data losses. But it also increases [bring your own device] to actually buildI HEADQUARTERS: the amount of storage needed. ing external partner networks in order to Canberra, Australia Despite the huge quantities of data being quickly digitize ﬁlm and sound artifacts handled, the NFSA doesn't have the same into formats that are more accessible in I CIO: Miriam Waterhouse big data problems that plague many other the information age." I CIO Mission: To excite people's organizations. Mainly, that's because the One recent project, part of an emerging curiosity and inspire their creativity archive does not need to mine or otherwise program called NFSA Connects, linked through development, preservation crunch the data, Waterhouse says. Future Grammy award-winning musician and and an informed understanding of projects, however may consider mining singer-songwriter Gotye to four schools Australian film, sound and emerging media collections to generate metadata for across Australia via videoconferencing. new media heritage, its cultural shot listing and facial recognition. In these online sessions, Gotye shared his diversity and significance. Still, Waterhouse's team discovered that musical composition and performance to handle huge volumes of unstructured technique with students. The NFSA is also I NUMBER OF EMPLOYEES: 250 data efﬁciently, the storage systems needed exhibiting an interactive sound and light (including 20 IT staffers), plus some to be upgraded, and so did the archive's sculpture designed and built by Illuminoutsourced IT services workers network, which was recently boosted to art in collaboration with Gotye — called I NUMBER OF DIGITAL FILES a 10-gigabit connection. "Intelligent data "Fractured Heart," the sculpture provides ARCHIVED: 1.9 million, including storage and networking is where our chalNFSA visitors a fun way to engage with films, television programming, video lenges and opportunities are," Waterhouse music, sound and light animation through and audio files says. "How we store it, where we store it, and physical movement. how we can expand for the future." NFSA also hosts a website known as DATA: NFSA In addition, the NFSA team had to sepaTwelve Canoes, which paints a compelling rate and compartmentalize much of its data portrait of the history, lands and culture of stores. "We can't have these large video ﬁles impacting our other the Yolngu people, offering a rich, immersive and interactive learnbusiness and communication systems. It would just slow every- ing experience that teaches viewers about some of the country's thing down," Waterhouse says. "And we've had to look at both the indigenous people. 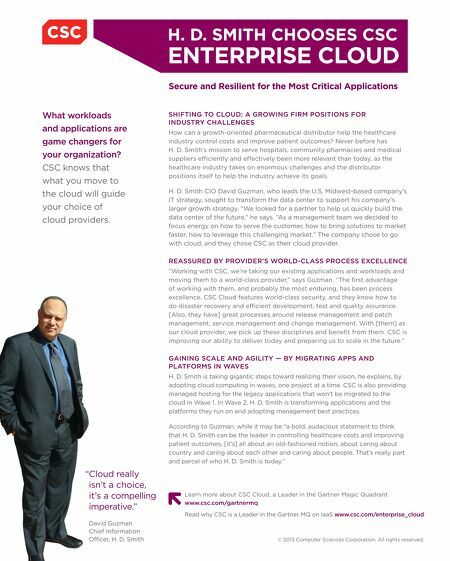 infrastructure and technical architecture needed to support that." Looking ahead, Waterhouse sees a bright future for NFSA. "This Waterhouse's team is already extracting value from the digital is an exciting time for me as a CIO," she says. "Unlike traditional data stores, since ﬁlm producers can come to the NFSA to obtain enterprises or many government agencies, my team and I are footage. But ﬁnding the right footage isn't easy. To make it easier, the dealing with 'living' information assets, including ﬁlm clips, video NFSA associates metadata with media ﬁles. NFSA is also involved segments and sound. We can't ever forget that we're our nation's in developing and implementing standards and codes associated living archive." I with this type of data. 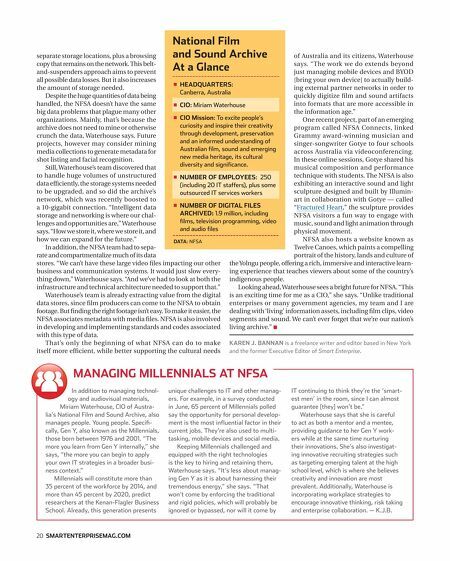 That's only the beginning of what NFSA can do to make KAREN J. BANNAN is a freelance writer and editor based in New York itself more efﬁcient, while better supporting the cultural needs and the former Executive Editor of Smart Enterprise. MANAGING MILLENNIALS AT NFSA In addition to managing technology and audiovisual materials, Miriam Waterhouse, CIO of Australia's National Film and Sound Archive, also manages people. Young people. Speciﬁcally, Gen Y, also known as the Millennials, those born between 1976 and 2001. "The more you learn from Gen Y internally," she says, "the more you can begin to apply your own IT strategies in a broader business context." Millennials will constitute more than 35 percent of the workforce by 2014, and more than 45 percent by 2020, predict researchers at the Kenan-Flagler Business School. Already, this generation presents 20 SMARTENTERPRISEMAG.COM unique challenges to IT and other managers. For example, in a survey conducted in June, 65 percent of Millennials polled say the opportunity for personal development is the most inﬂuential factor in their current jobs. They're also used to multitasking, mobile devices and social media. Keeping Millennials challenged and equipped with the right technologies is the key to hiring and retaining them, Waterhouse says. "It's less about managing Gen Y as it is about harnessing their tremendous energy," she says. "That won't come by enforcing the traditional and rigid policies, which will probably be ignored or bypassed, nor will it come by IT continuing to think they're the 'smartest men' in the room, since I can almost guarantee [they] won't be." Waterhouse says that she is careful to act as both a mentor and a mentee, providing guidance to her Gen Y workers while at the same time nurturing their innovations. She's also investigating innovative recruiting strategies such as targeting emerging talent at the high school level, which is where she believes creativity and innovation are most prevalent. Additionally, Waterhouse is incorporating workplace strategies to encourage innovative thinking, risk taking and enterprise collaboration. — K.J.B.